I had a request a while back for this ‘Make a face’ resource so thought I would show you some ways in which to use it. Print out the skin tone that you require. This resource has three different skin tones to suit all children. There are also 12 different sets of eyes and mouths and a set of emotions vocabulary flash cards. Laminate all the pieces and keep in a zipped bag for convenience. 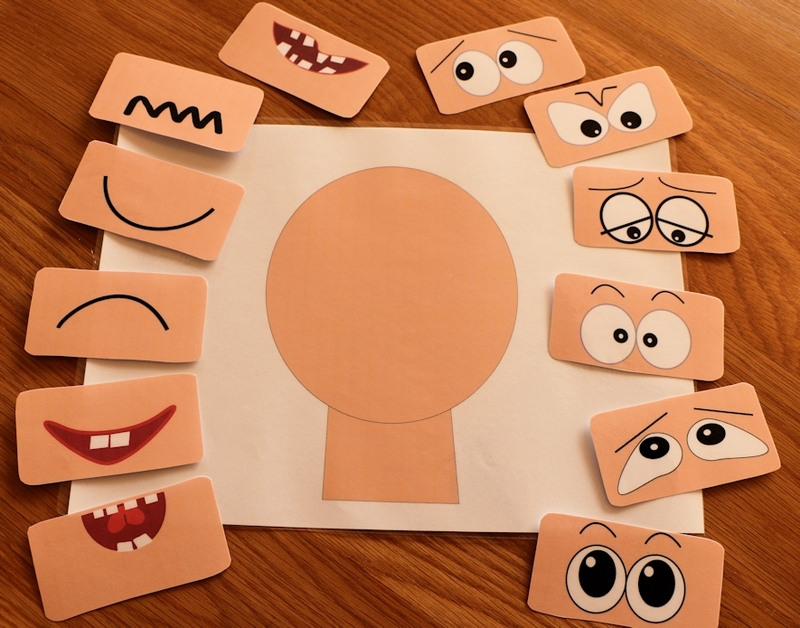 The aim of this resource is for children to begin to recognise facial expressions and talk about their feelings. It is excellent for children on the autistic spectrum. 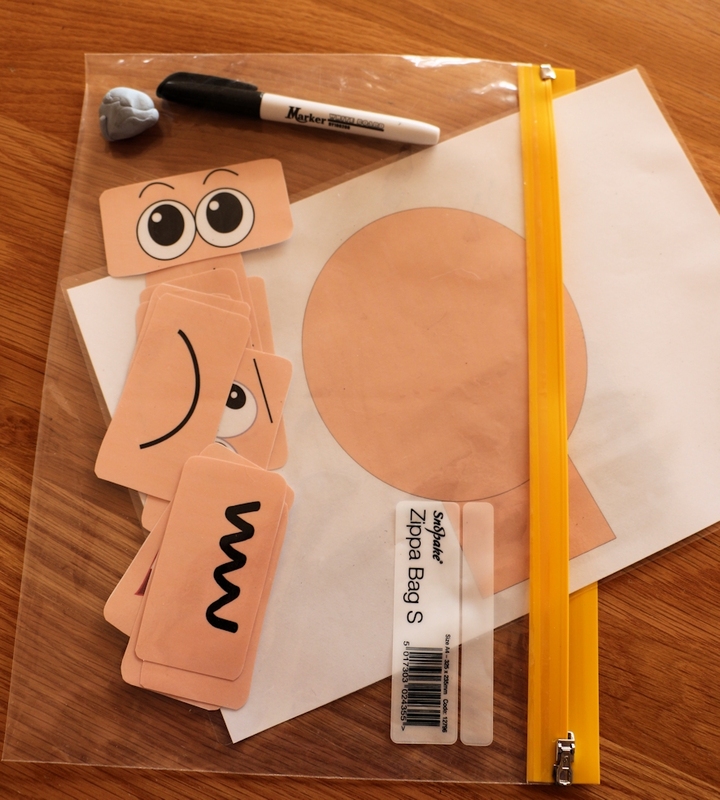 This resource is also very good for early years settings and can be put into an area of provision, allowing children to experiment and make different faces. Can they match the eyes to the mouth? Can they tell you what the expression is that they have made? Parents would also find this resource helpful for their preschool children. 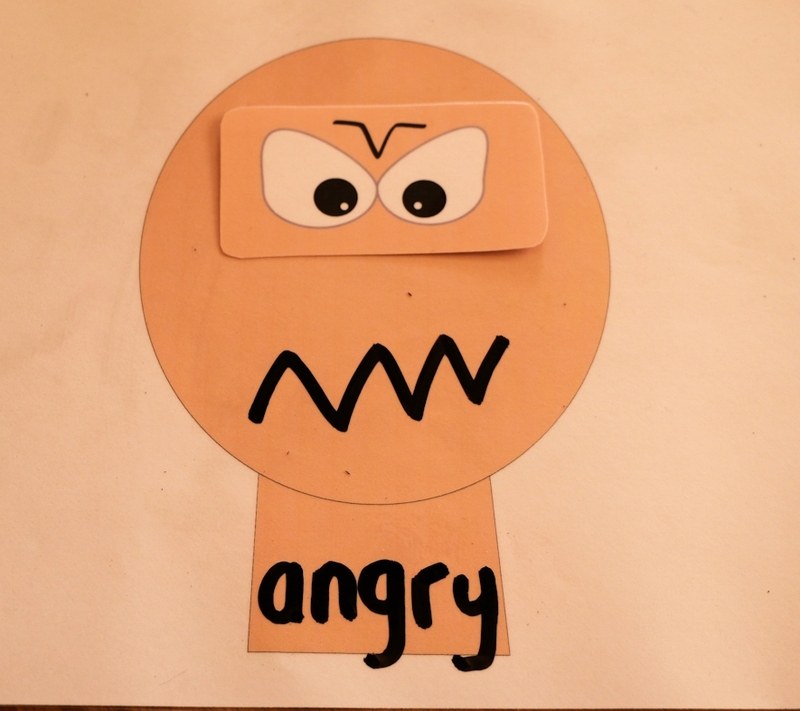 Questions you could ask – can you make me a ‘angry face’? What would ‘angry’ eyes look like? What would ‘sad’ eyes look like? 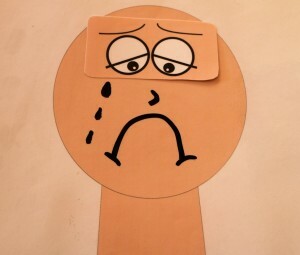 Can you make me a ‘sad face’? Also use other vocabulary such as ‘miserable, frustrated, terrified, proud’. What makes this face look sad? Would any of the other eyes fit with the mouth? Which other mouth would fit with the eyes? Have you ever felt sad? 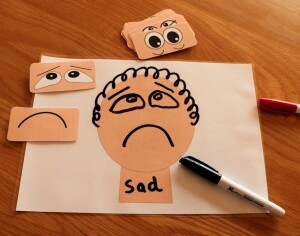 What happened when you felt sad? How can you tell that someone feels sad? Ask the child to find you ‘sad eyes’ and a ‘sad mouth’. Can they write the word ‘sad’? and then draw the face? Place ‘eyes’ on the face and ask the child to draw the mouth that goes with the eyes. You can do this the other way round too. Place a mouth on the face and ask the child to draw the eyes. Can they write the emotion word? Can the child write the emotion word? There are so many possibilities for working with this resource. The cards could be used as a matching pairs game. 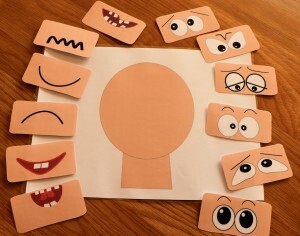 Lay out all the cards and ask a child to choose a mouth and eyes that match – name the emotion. Use the face (laminated) for drawing emotion faces. Put it alongside a mirror so children can make faces themselves. Use the angry eyes and mouth to discuss anger and how to recognise when they are becoming angry. What makes them angry? What could they do when they are angry? 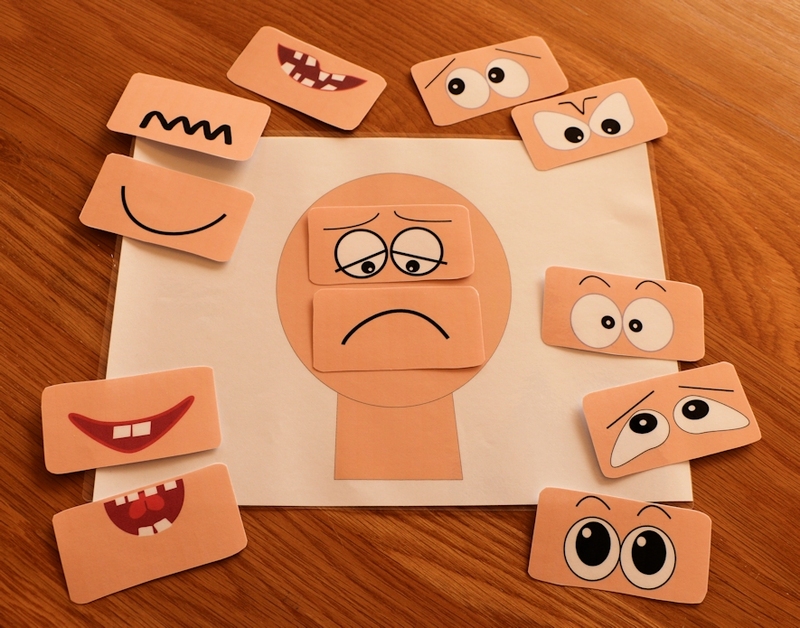 Pick an emotions flashcard(included with the pack) and make the appropriate face. Keep all the pieces together in a zipped bag along with a dry wipe pen and blob of blu tak – a perfect piece of ELSA kit! Hi Kathy, you should receive an email with a download link. Check your spam folder if you have not received it. If it isn’t there you can easily log into ELSA Support with your username and password. Go to your purchase history and download your resource from there. My account is debited but I have still not received my order . Kindly look into it and revert. Hi Kavita, I replied by email to you yesterday and actually attached the resource for you. Also it wasn’t this resource you purchased but the Anger Mananagement lapbook resource. Please check your spam folder. I am absolutely sure that is where my emails are going. Unfortunately there is no other way of me contacting you. I hope you see this. Hi Debbie, a friend recommended this book, The Soul Bird, by Michal Snubit, a lovely book and perfect for ELSA work. I’m not clever enough to share on the ELSA FB page with a picture/link, you can buy it on Amazon, and was hoping you would!! Yes Tina, you should get an email almost immediately as it is sent automatically by the site. Check your spam folder if you do not receive it. You can also log onto the site with the username and password you have just set up and download the resource from your purchase history. I just purchased and downloaded the Make a Face activity kit. I am a mental health therapist and can think of all kinds of ways to use this with kids. Thank you! Yes, I live in the US. How much is this kit in US dollars? I look forward to downloading the Make a Face activity for use with our dementia residents. I am a carer/ac and love resources such as this one. Thank you! Hello I am interested in getting this emotions pack, I am from Mexico city. Would you please tell me how I can get this? Ok, I made the purchase but I need to know if they will be mailed or do I need to download them? Yes the downloads should have been sent to your email address. Please check your spam folder if they have not arrived. You can also log into your account with your username and password and download them from your purchase history. I am a french teacher from Greece! !Thank you very much!! !They are great!!! I really like this idea. I think i will try it (in german) because i live in Germany. Can you send me the link? Hi the link is in the post above. I just printed out these faces and plan to use them with my client who is on the spectrum and learning how to replicate art. I printed two copies so that I can make one, and he can copy what I made. Thank you for this great product! I just downloaded the Make-a-face-materials. Thanks for the nice materials. 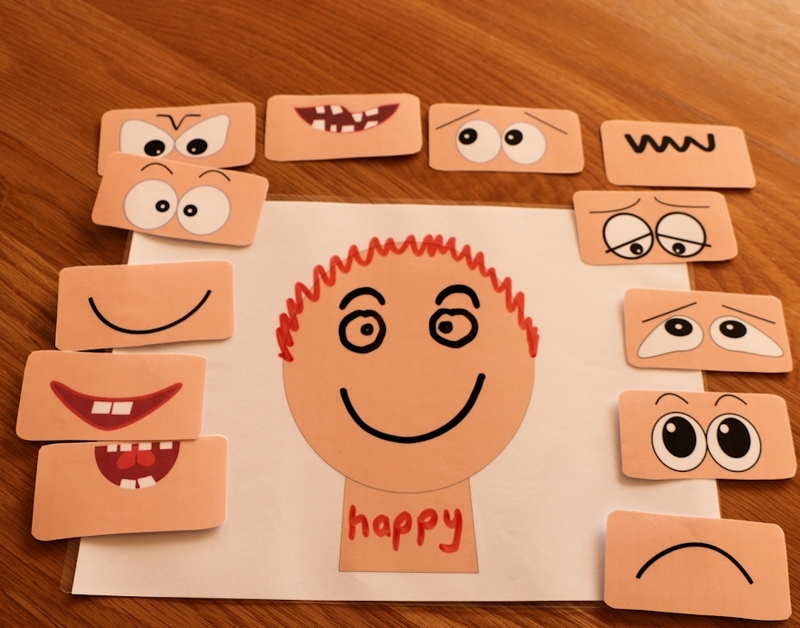 Hi Lisa, It is purely an experimental tool for children to explore different facial expressions and come up with their own words. 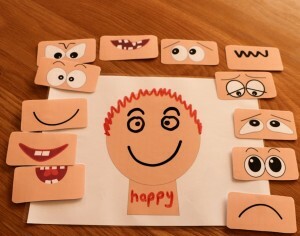 You can also use it by asking children to make a ‘happy face’ or a ‘sad face’. That said, I will certainly give this some thought when I next update the resource. I work in a Kindergarten and please want to Download these material. can you please send me an email. Thanks!